I’m missing the Cherokee’s turning radius. At times, I go into another never-ending, ground-eating, horrendous U-turn with the Dodge and wonder if I will come out of the turn in the same county. If I start into a U-turn in the afternoon, sometimes I speed up a bit so the turn is completed before dark. I also glance at the fuel gauge before going into a U-turn to be sure I will have enough gas to get me through the turn. I look into the driver’s mirror from time-to-time and see the back of the pickup tracking slowly behind, ‘bout a quarter mile back. I swear I could pull a U-turn with the Cherokee pulling the casita in the distance I could spit. Sure do miss the old turning radius. Already got into some trouble out in the sticks. Oh well. I was standing there one day looking at this behemoth next to the casita and went to get a tape measure. It seems I live in a boxmy HOUSEthat measures less than 14 feet long. I tow it with a vehicle that is20 feet long. Is there something wrong here? 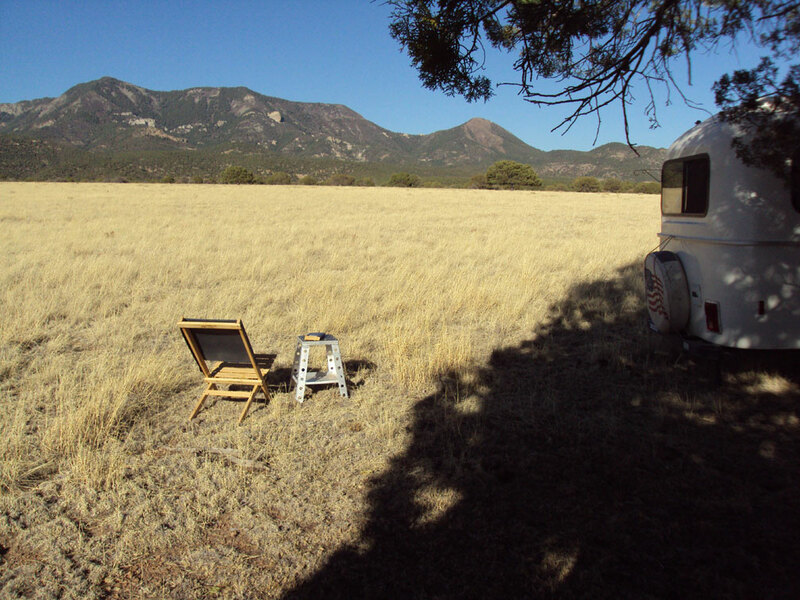 Maybe it is time to move up to a 19 foot Airstream Bambi. 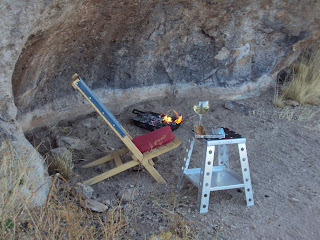 I got a late start out of Bisbee and when we got to the place I wanted to camp, it was dark so I didn’t let M&M out. 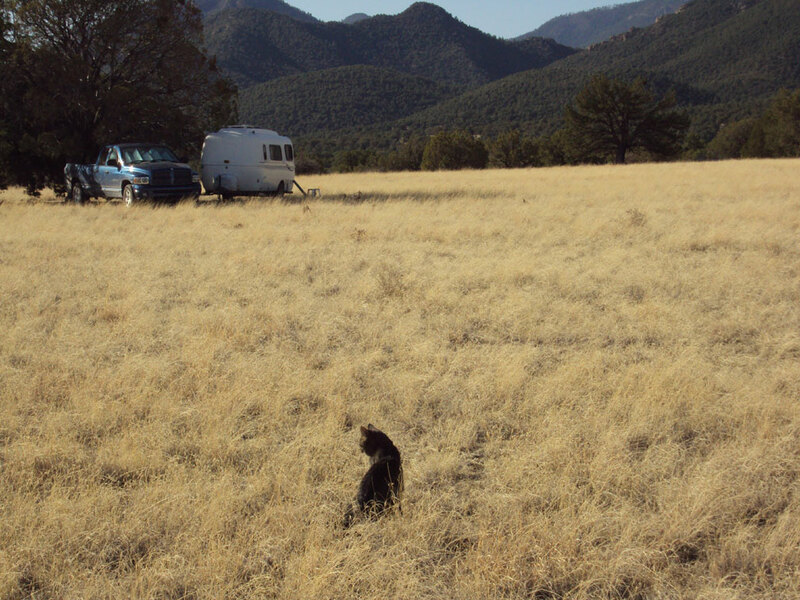 They must have really been wondering what was goin’ on‘Three weeks being kept inside, except for the window cage and now we get out to the desertand we get carried from the pickup back into the casita? !’ After I let them out the next morning, I rarely saw them for the entire day. Took my mountain bike into the Gila Hike and Bike in Silver City, where I purchased it, for its annual tune-up. I can never seem to tune it as well during the year. Oh well. It came out of the shop SO clean that I almost didn’t want to take it out on the dirt trails. 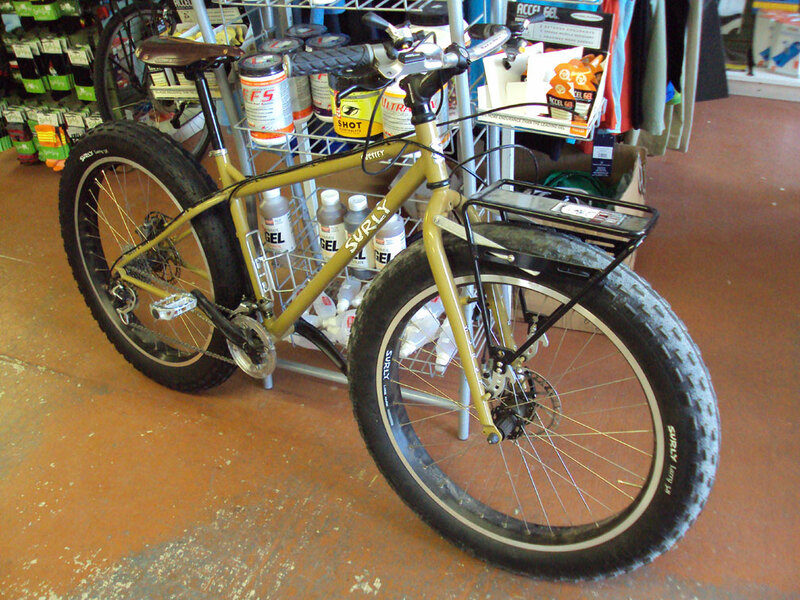 Saw a REALLY NICE Trek in the shop for only $700. I’d really like one with 29” wheels, though, but they go for twice that. Sure wish I needed a new bike. It was the week before the annual Tour of the Gila’s and they had some impressive road racing bicycles in the shop. Those bikes only weigh 15 pounds. Many of the pro racing bikes go for $15,000 and some go for over $30,000. That’s when it is nice to have a sponsor. There was a type of bike in the shop that I hadn’t seen before. The tires were the size of motorcycle tires. I asked about it and the bike was designed for the Iditabike Race up in Alaska. The owner of this bike got it for riding the sand down in Baja. It’s an eye-catcher. Lost the weight I put on with all the eating out and wine while in Bisbee. Also took a good look at some of my staples and cut two high-fat ones out of my diet. Definitely will take some getting use to not having them around to eat but it’s not like I need extra fat in my diet. Health or comfortnot much of a choice once I stopped to think, especially as I get older. I accidentally shorted out part of the 12V system in the casita so I took it into Lowry RV Sales and Service in Silver City. They also cleaned up the propane igniter assembly for the fridge. They quickly had the work done and it only cost $45. Jimmy’s RV Service down in Deming is well known for doing good work but he was backed up nearly a month. Went hiking up Cooke's Peak one day with Tim. If you are in the area, it’s worth doing. Take rt26 to just past mm 14 (heading east). 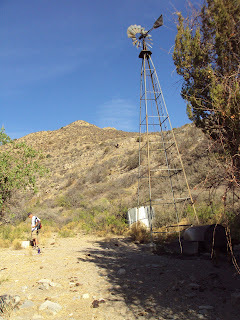 Turn left onto Cookes Canyon Rd (there’s a huge water tank there on the south side of 26). You’ll eventually see an abandoned ranch on the left. There is a stone column and a pull-out on the right. Park there (32˚ 31.494’ 107˚ 40.401’). Continue to walk up the road 200 yards and hike up the road on the left towards the ranch. At the tailings, hike cross-country to the notch in the mountains on the other side of the hills (Cooke's Canyon). It might be best to hike over the hills on the right side. Once in the notch, you’ll see a windmill. The singletrack starts just past it on the right. This guy with the rattles was waiting for us up the trail a bit. That's the trail just to the left of him. He did NOT want to move and it was in a place where we could not just make a loop around him. 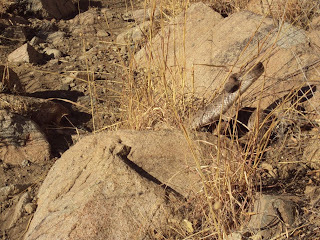 I wanted to get a closer shot but as I was moving in, I thought that getting closer to a coiled pissed-off rattler while looking through a viewfinder was maybe not too smart. I stopped about 20 minutes short of the peak. I can’t trust my balance so there was no way I wanted to climb up the rock face, let alone climb down it. I sat down under a tree and read a paperback until Tim climbed back down. Tim’s dog, Abby, took a snooze. Plan 6 or 7 hours for the hike. I was REALLY chomping at the bits for some isolated camping. Managed to get some in towards the end of the month. The second photo reminds me of one posted during last summer’s house-sitting stint. The felines travel well but being the first time in a while on rough roads seemed to have Meadow a bit upset. We were really bouncing around for a couple miles on an unimproved road when Meadow got up and jumped into the litter box and upchucked a couple times. Luckily we only had another half mile to go before I could let her out while I set up camp. First time that happened. No problem on the way out. 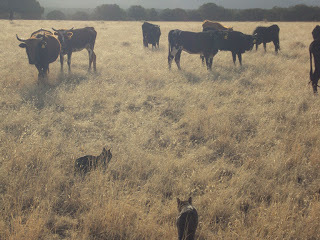 I know the exposure is WAY poor but that’s M&M checkin’ out the free range cows one morning. Nice spot. Plenty of rough roads for mountain bikin’. The light turned yellow and the driver slowed down and stopped rather than try to beat the light. The tailgating woman behind him was furious and honked her horn, screaming in frustration, as she missed her chance to get through the intersection, dropping her cell phone and makeup. As she was still in mid-rant, she heard a tap on her window. A police officer ordered her to get out of the car and put her hands up. He took her to the station where she was searched, finger printed, photographed and placed in a holding cell. After a coupe of hours, a policeman came by, opened the door, and took her back to the booking desk where her personal effects were returned to her. I found this listed with jokes but it kinda rings true. Some of the most unChrist-like and intolerant people I have come across in my adult life have professed to be religious. Then again, there are others who actually practice what they preach. health and peace to all people. and may the rains be a source of tranquility to all.